There is an otherworldliness to Hartmann’s Valley. 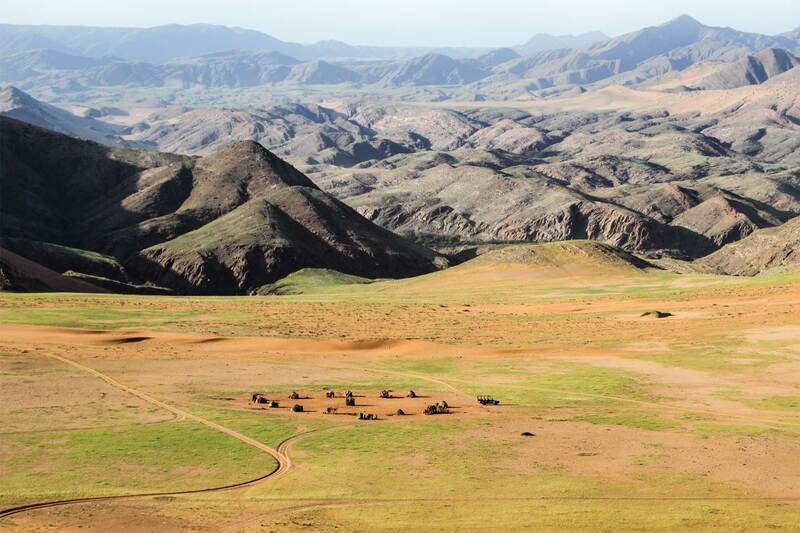 The remoteness, the drama of rolling red sand dunes against layers of grey mountains, and the tantalising sound of flowing water as the Kunene River divides the wilds of Namibia from the mystery of Angola. 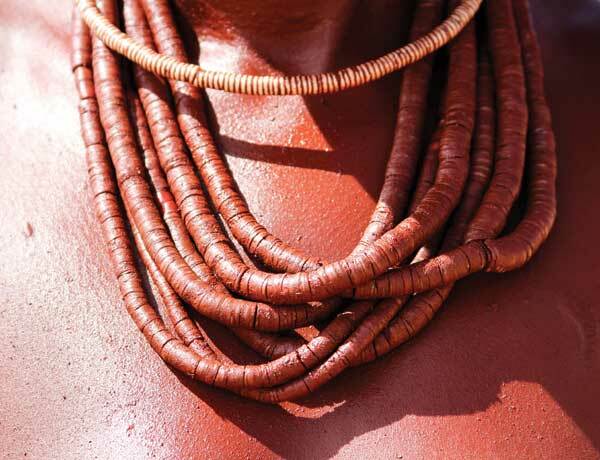 T here is one group of people who complement and complete this natural extravagance – the Himba. 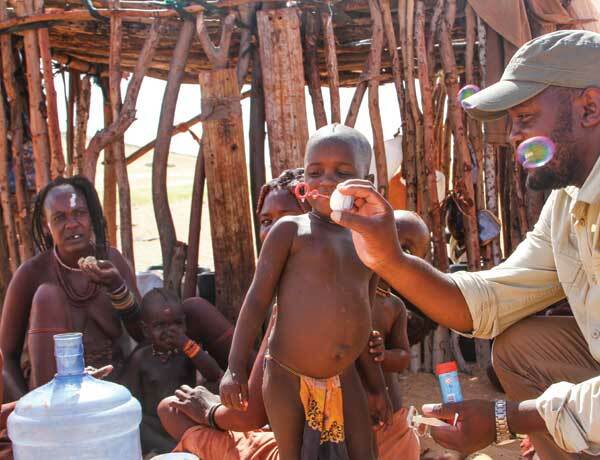 From Wilderness Safaris’ camp at Serra Cafema we drive towards the Himba village Otapi. From a distance the outline of a circle comes into focus. It is shaped by sparsely formed domed huts and no sign of life. It could have been there for a thousand years. As we drive closer, the immediacy of life brings the scene into focus. Cattle graze in the background and a small cluster of women and children rest in the shade against one of the huts. My guide, Darius, stops the vehicle, picks up a walking stick and together we slowly make our way towards the group of women. 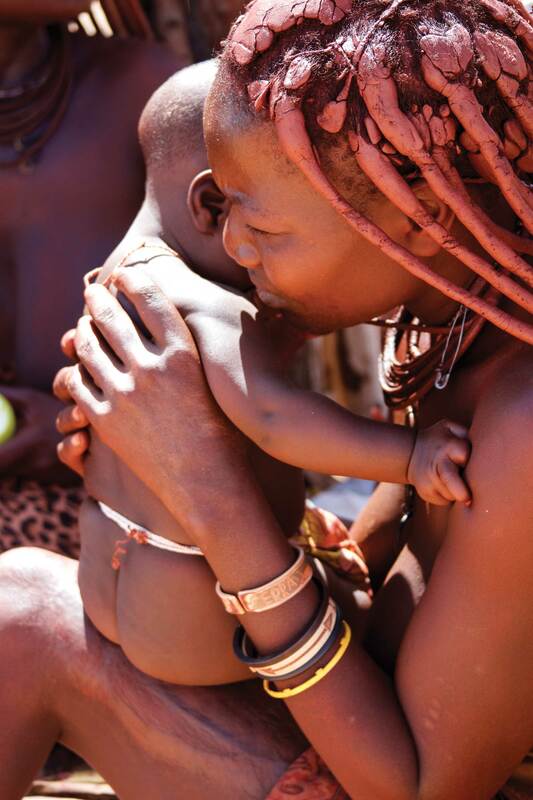 One woman nurses her baby. Toddlers beat on an empty water bottle. Two elderly women exchange words that could be aggressive or simply animated conversation, if one only knew the language. Nursing, drumming, yelling, they continue as if we weren’t there. After keeping a respectful distance for a while, Darius moves closer to the group and greets the women. They listen, they laugh and then they motion for me to come forward. I nod and smile. They laugh. At me or with me, I’m not sure, but my smile broadens. Through Darius I ask their permission to ask them a few questions and to take photographs. The two elderly women stop yelling and nod their heads. That will be ok. This is the dance of respect. It is essential and right. We start by talking about the weather – a universal conversation. How were the rains? Is the grazing good? What happens when the rains stop and the grasses disappear? For a semi-nomadic people the answers come easily. They move with the rains to where their beloved cattle and goats can find good grazing. When the rains stop they no longer milk their cattle, but use some of the money they earn from tourists to buy staples such as beans and sugar from Angolans across the river. Before I could ask more questions, one of the elderly women stood up and walked closer to me. She pointed to her bare feet, then ran her hands up her legs, spun around and flipped her leather skirt while her hands continued up the length of her body before resting on the top of her head. A running stream of commentary accompanied these actions, as Darius explained what she was saying by pointing to the metal bangles circling her ankles and to her hairstyle and leather belt. She showed me the markings on her chest where cuts were made long ago to release an illness. 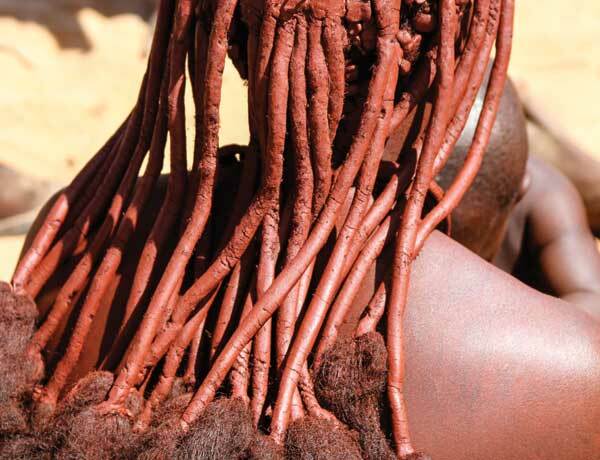 This is just one of the many traditions of the Himba. 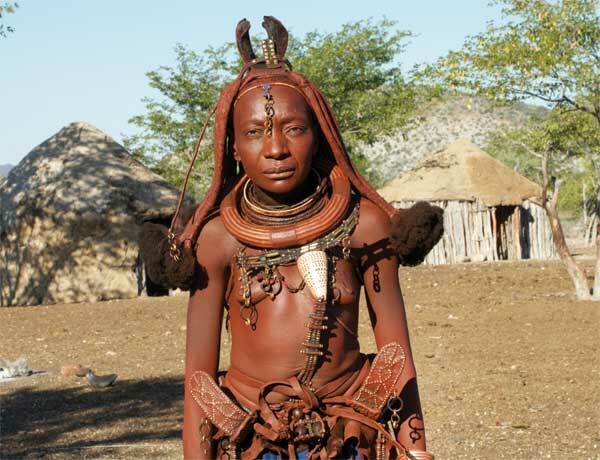 Their clothes, their hairstyles and adornments signify stages of life from childhood to puberty to marriage and motherhood. It is a beautiful, evolving chronicle of life that hasn’t changed in centuries. 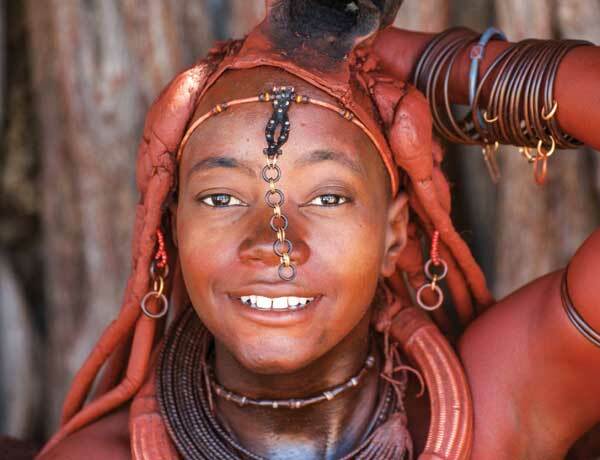 She ends her soliloquy by saying that she’s proud – proud to be a Himba and proud that tourists are interested in her culture. We talked, I laughed, more easily now, and I took a few more photographs. No one posed, no one was asked to. 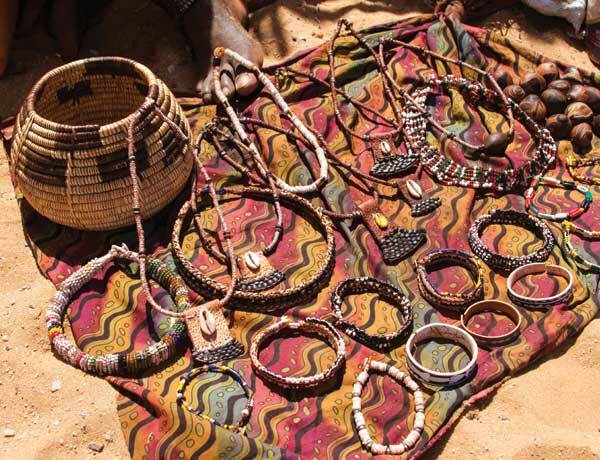 Before I left, they spread a cloth in the sand and laid out a few carved makalani nuts, some bangles and necklaces that they had made using traditional skills and materials and were now giving me a chance to buy. I selected a necklace. 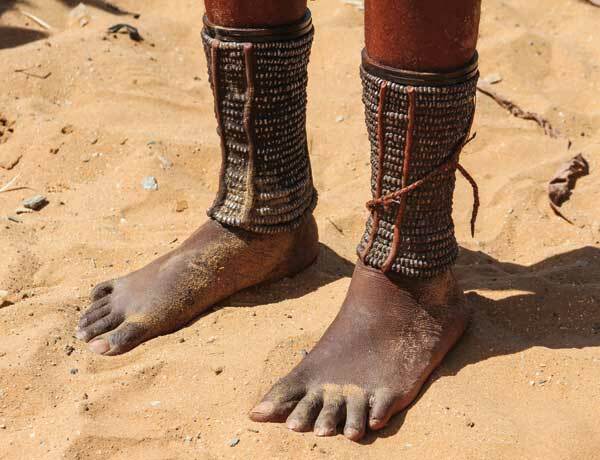 It reminded me of the bangles around the woman’s ankles. It was a natural exchange and a natural time to leave. Driving away, the scene was rewound. 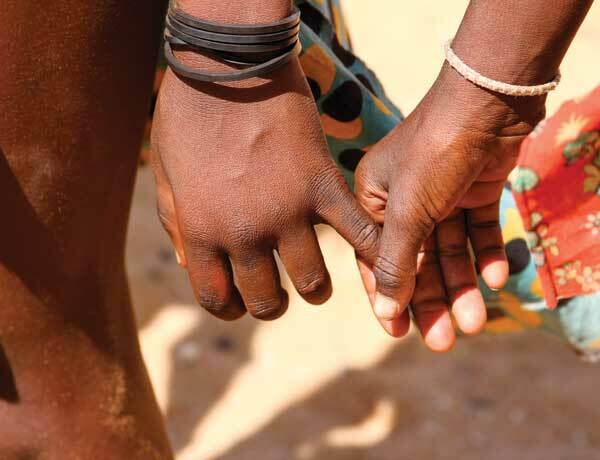 The children played, the shadows swallowed the group of women, the huts became a wide circle against the desert backdrop, and life continued, unhurried and unchanged, as it has for thousands of years. Their clothes, their hairstyles and adornments signify stages of life from childhood to puberty to marriage and motherhood. It is a beautiful, evolving chronicle of life that hasn’t changed in centuries.